Fun, Quick, & Easy School Breakfast Ideas…School is Back! We all know that breakfast is the most important meal of the day! Back to school season is coming up and some of us may be torn. What are some great back to school breakfast ideas that will cater to hungry bellies? Do we have the time for fun breakfast ideas or do we need quick breakfast ideas that fill the kiddos? Below is a list of ideas that are sure to peak your interest and get you out the door on time! You can also celebrate the school year with these other back to school ideas. Or, make school lunch more fun with these great school lunch ideas for kids! Going out to eat? Check out where Kids Eat Free every night of the week in Kansas City! If you want to give your morning a creative edge you can try one of these cute school themed ideas. If you have one of those nifty pancake pens then you can draw just about any design and pencil-shaped pancakes can do the trick for a back to school treat. 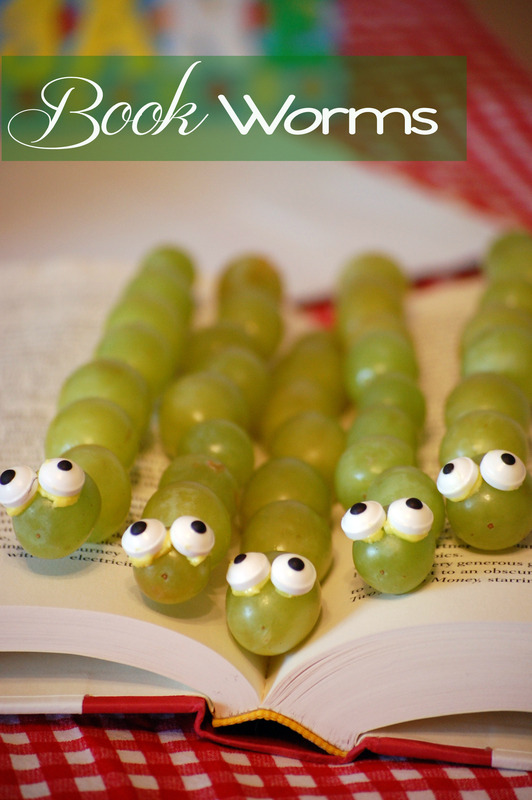 For this recipe, you can use a short kabob skewer and some green grapes strung together to be bookworms. You can also include other fruit in this healthy breakfast to switch things up a little! For a fun breakfast touch, use food markers to draw on a face or use cream cheese and raisins to make eyes. Fun breakfast for kids doesn’t have to mean complicated…this can be a quick breakfast idea for any day! This is a fun breakfast idea for kids worried about their first day. For a nervous child returning to school, put a little morning sweetness in their step with these worry-free donuts. All you need are some tasty donuts, bread sleeves and a printer for this creation. For an extra bonus write your child a motivating note to help get their day started! An apple a day may keep the doctor away but these waffles can be a fun and healthy breakfast idea for a back to school treat. Real apples are baked into the batter and then with a little imagination apple waffles come to life! Check out this yummy recipe and maybe add a bookworm for a little extra delight! “The wheels on the bus go round and round”. Some little ones may be singing their way through breakfast on the first day of school with this recipe! A little creativity, some fruit, and French toast go a long way for this yummy creation. Get your morning going with this recipe! This recipe is cute for the little ones. (and it’s a more simple breakfast…) The best choice is to use a melon variety that can easily be sliced into thick slices and shaped into letters with cookie cutters. Then serve this yummy idea with a bowl of oatmeal or peanut butter toast with their name spelled out on it. These recipes are perfect for those that like to prepare items in advance for the week. They are filling and can be made in many a variety. Who has time during back to school season? The great thing about casseroles is that they can be prepared with just about anything from the fridge in advance and warmed up quickly when you are in a hurry. Here is a link for 15 delicious quick & simple breakfast casserole options to get your mornings going! Another quick and healthy option to get the day started off right. These oats can be prepared in advance for a healthy and quick breakfast for kids. You can choose from the readily prepared version or prepare them yourself with preferred ingredients. This link gives you options for both! This option is perfect for an easy breakfast. Prepare these kid-friendly muffins at home & save for a quick breakfast later! They are advertised as low in sugar and high in healthy ingredients. (Hellooo healthy breakfast!) The website even says they hold up well after being frozen which means you can bake a bunch to save for later! Yes! Your kids will be delighted when they find out we are having dessert for breakfast. This healthy breakfast idea makes popsicles with low-fat yogurt and fresh fruit. You can add granola if you want to make it more like a parfait. This easy to prepare recipe will be great for early in the year when the weather is hot. My kids love breakfast burritos and they are so easy to prepare in advance. The best part is that you can change up the protein sources to give them a little variety. We use bacon, sausage, chorizo or ham in ours along with the staples of eggs and cheese. I will prepare a bunch in advance and pop them in the freezer to be warmed for later. Here is a link for a recipe to get you started! Most days I am struggling to get the kids out of bed and dressed. By the time we get to breakfast, it’s time to walk out the door. There is no way I am letting them eat pancakes and eggs in the backseat of my car so I turn to healthy options that have limited mess potential. These healthy fruit and veggie snacks are great to grab on the go with less mess. They are good for a quick snack or an accessory to any breakfast for kids (or adults). Here is a list of healthy granola bars for kids that would be a good option for the morning munchies: Plum Organics Mighty 4, KIND Kids Bars, CLIF Z Bar Protein, ZONE Perfect Kids, Happy Kid Bars. These are my favorite options healthy breakfast for kids on the run. Any combination of fresh fruit, yogurt tubes or cheese, whole grain toast, bagel or English muffin can go a long way during the morning and they aren’t time-consuming prepare. Your kids can even grab and go on their own which will save you time as you are running out the door! Here are some quick breakfast ideas for shakes if you don’t have time to prepare them on your own. These are quick options with some great health benefits. You can try Organic Valley Breakfast Balance Shakes, Carnation Instant Breakfast, Kidz Superfood Powder, Orgain Healthy Kids Shakes and Olly Kids Smoothie Protein Powder. Any of these options would be a great way to start off the morning. Writing this article I not only shared some of my quick breakfast wisdom but discovered some new (more complicated) options along the way. And hey, who doesn’t love breakfast?! Get our Weekend Planner delivered straight to your inbox every week, so you don’t have to go searching! Be sure to get The Scoop, so you don’t miss a thing to do in Kansas City. 10 Fun Fall Drinks – Get in the Festive Fall Spirit Now!